One can speculate on "sabotage" or “accident”. At this level of destruction, nothing is an accident. Accidents such as these only happen through carelessness, lack of attention and expediency. This is why we have insurance companies defining liability and culpability, with no-claim bonus. Note: this is NOT the FIRST such restoration of old buildings in France where the building went up in flame “during the work”. Some uncouth French people have alluded to a "restoration closed-shop (mafia)"... I do not know. So how can a country that built the Concorde and the A380, is unable to restore a cathedral without burning it down? Does the answer to the question lies in that modern building technique aren’t suitable for such cathedral restoration work which demands über qualified stonemasons, companion carpenters — companion charpentier-meunuisier in France is a famous restricted guild of skilled workers who have completed a rigorous apprenticeship and further training by going from town to town country-wide to be versed in the traditional often secret methods of woodworking, such as understanding wood grains, using hand tools and deep respect for the timber, plus using the more accurate measuring sticks instead of laser pointers, thus allowing for elegant adjustment imponderable instead of being tight fitted — and roofers from their old guilds as well, rather than tradesmen (women up there on the scaffolds? you’re kidding...) in yellow vest, heavy mud boots and hard hats, and engineers with degrees from the school of saving a few bucks? Am I too uncouth, unless I have read somewhere in the ether that God let young Mohamed Wahab use his acetylene/oxygen cutting tool above the old dusty beams of the grand dame… This is below the belt before any police investigation. My first conclusion was DUST. See: restoration gone wrong...? When I read the fundraising pitch I giggled, because my stomach contorted the way it does when a plane drops a little. But, surely, the pilot is still in control. It’s just the normal turbulence of secularism. And the slightly panicked whinny in the plea for money is just a silly overreaction. The plane will steady itself, right? I’m putting it out of my head. And now the French are planning to rebuilt the damaged parts with 150 millon Euros in five years… Dresden did it, why not Paris? Why not France? Would believe 1.2 billion? Macron the failed re-builder of France so far is going to give it a go, for Paris… It could be painful to watch. They will have to deconstruct the scaffolding and build a new one entirely — plus clean up the smoke affected stones. They did not in Dresden as a reminder of the war. Well, in 2017, the rites of the Catholic religion aren’t yet entirely unknown in France. But I recently discovered that, contrary to Proust, there are limits to state subsidy. The French state does own the Cathedral of Notre Dame, and knows it is a major draw for tourists to Paris. The government kicks in about 2 million euros a year for basic maintenance. But pieces of the cathedral have been falling off it for years. Major repairs haven’t been tried since Marcel Proust was a teenager. The archbishop of Paris is now seeking about 100 million euros to do the work that needs to be done. And this fund-raising campaign is aimed partly at Americans. I giggled at the solicitation for funds. Maybe the archbishop read one of those misleading Pew surveys that tout how “religious” America is compared with Europe. Maybe Americans are suckers for this kind of pitch: By contributing to the campaign to save Notre Dame, they’ve put an imaginary down payment on that long-dreamed-of trip to Paris. The destruction of Notre Dame is a cultural tragedy, but things won’t change really. The roof was leaking and stones were falling. It had to be fixed, so what better way to fix it that have a bonfire and redo it from scratch, bar a few historical bits. I can't see the progressivists demanding the space to be rebuilt in a Pompidou centre style to celebrate the 21th century, so one has to be prepared that modernities don't infiltrate the rebuild. As an aside, the National Review is based on the philosophy of "fusionism” developed during the 1950s under the editorship of William F. Buckley, Jr. and with his associate editor Frank Meyer. In his book, In Defense of Freedom, Meyer defined freedom in what Isaiah Berlin would label "negative” terms, as the minimisation of the use of coercion by the state in its essential role of preventing one person's freedom from intruding upon another's. One needs small shoes. Here with the pseudo-battle between Democrats and republicans, we’re far from this anti-coercion ideal and with about 90 per cent of the American citizenry being gun-ho and dreaming of corrupt, we cannot expect miracles, especially when Uncle Rupe manipualtes the mind of people (I had to mention Mr Murdoch in this essay, any matter what...). Even god does not do miracles any more, otherwise the restoration team up there on the scaffoldings would have had a fire safety officer with a bucket of water. Former restorer of a few houses with an atheistic measuring stick. The Roman city of Lutetia (also Lutetia Parisiorum in Latin, in French Lutèce) was the predecessor of present-day Paris. Impressive monumental remains of the ancient city can still be seen in situ. The city was referred to as "Λουκοτοκία" (Lukotokía) by Strabo, "Λευκοτεκία" (Lefkotekía) by Ptolemy and "Lutetia" by Julius Caesar. The origin of this name is uncertain. The name may contain the Celtic root *luco-t-, which means "mouse" and -ek(t)ia, meaning "the mice" and which can be found today in the Breton word logod, the Welsh llygod, and the Irish luch. Alternatively, it may derive from another Celtic root, luto- or luteuo-, which means "marsh" or "swamp" and which survives today in the Gaelic loth ("marsh") and the Breton loudour ("dirty"). As such, it would be related to other place names in Europe including Lutudarum (Derbyshire, England); Lodève (Luteua) and Ludesse (France); Lutitia(Germany); Lutsk (Ukraine); Pryluky (Ukraine) and Velikiye Luki (Russia). "Lutetia parisiorum" or "Civitas parisiorum", "the city of the parisii" was the name given by the Romans to the village where the parisii tribe lived, a Celtic tribe, in the third century BC. The name was later shortened by the Romans. A fire alarm reportedly first went off inside Notre Dame Cathedral at 6:20 p.m. Monday, local time. 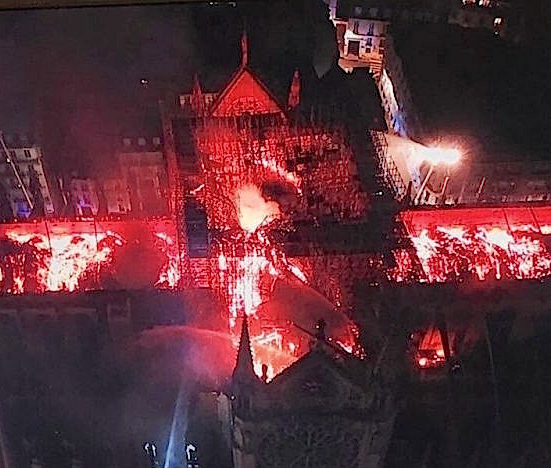 However, according to the official investigation, cathedral staff unsuccessfully searched for signs of a fire for 23 critical minutes, and were unable to determine the reason for the alarm. It wasn't until a second alarm went off at 6:43 p.m. that a fire was detected in the attic of the centuries-old religious landmark, French officials said Tuesday. Heitz said the initial alarm, which was looked into by cathedral staff and not firefighters, caused the church to be evacuated but did not lead to the discovery of the fire, according to the Washington Post. "We are favouring the theory of an accident," Heitz told reporters Tuesday, adding that the investigation into the blaze would be "long" and "complex". "In the meantime, the church was evacuated because a Mass had just started a bit earlier," Heitz said. In the aftermath of the fire that devastated part of Notre Dame, the satirical weekly made jokes about the timetable of reforms that the executive must propose. The face of the president spreads out on the cover, wearing a cathedral on fire. 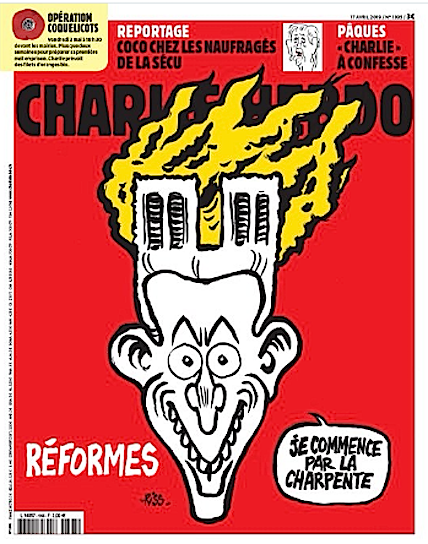 Reacting to the fire that ravaged the roof and the spire of the Notre-Dame cathedral on April 15, the satirical weekly Charlie Hebdo quips about the disaster on the cover of his number that will be in the stands on April 17 and even , exceptionally, from this April 16 in fifty or so Parisian kiosks. Representing the face of Emmanuel Macron whose head is crowned with a cathedral in flames, the cartoonist Riss wrote "Reforms" and added a speech bubble that reads: "I start with the roof." Confronted for several months by a social crisis, Macron was to speak on the evening of April 15 about the construction of new infrastructure projects, following the Great National Debate, but the fire of Notre-Dame de Paris upset the politico-media calendar . Emmanuel Macron postponed his speech to go to the forecourt of Notre-Dame in Paris. PARIS — The pledges came in quick succession. François-Henri Pinault, France’s second-richest man, put up an eye-popping 100 million euros to rebuild Notre-Dame, just as firefighters were dousing the last flames at the cathedral early Tuesday morning. Not to be outdone, Bernard Arnault, France’s wealthiest scion and a fierce rival to Mr. Pinault, upped the ante with a 200-million-euro gift a few hours later. But the spectacle of billionaires trying to one-up each other quickly intensified resentments over inequality that have flared during the Yellow Vest movement, just as President Emmanuel Macron was looking to transform the calamity into a new era of national unity. There were accusations that the wildly rich were trying to wash their reputations during a time of national tragedy. The firestorm began when Jean-Jacques Aillagon, a former culture minister and now adviser to Mr. Pinault, went on Twitter after Mr. Pinault announced his gift Tuesday to suggest that corporate contributions to Notre-Dame’s restoration be given a 90 percent tax deduction, rather than the 60 percent that corporations normally get for charitable contributions. The reaction was so intense that Mr. Aillagon went on the radio Wednesday morning to retract his suggestion. The Pinault family then announced that they would seek no tax deduction at all for the gift. “It was very revealing about the sensitivity of the whole issue,” Mr. Haski said, coming in the midst of a great national debate about the yellow vests and their protests against inequality and fiscal privileges. In general many are relieved that Notre-Dame still stands, and if there is now a billion euros to reconstruct it, without calling too deeply on an already stretched national budget, that may be enough. La cathédrale Notre-Dame de l'Assomption d'Alep a été reconsacrée le 23 avril après avoir été ravagée lors de la guerre en Syrie. The Cathedral of Our Lady of the Assumption of Aleppo was reconsecrated on April 23 after being ravaged during the war in Syria.